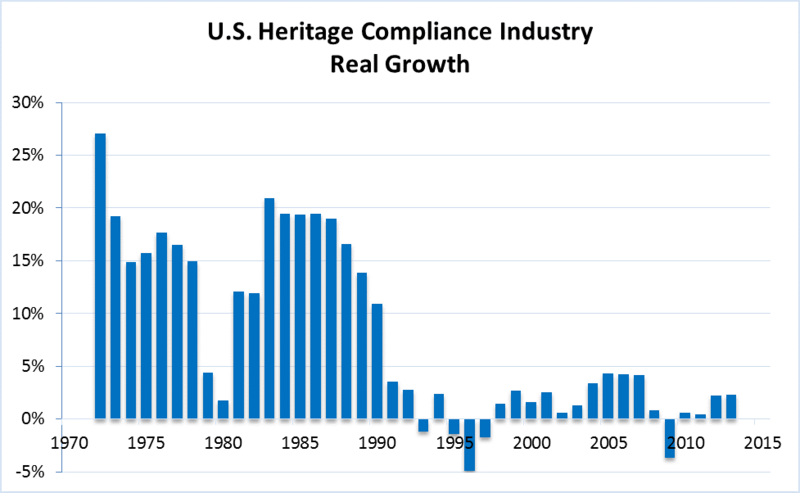 A new analysis of data for the United States heritage compliance industry presented at the Society for American Archaeology annual meeting in April 2014 shows that the industry grew at a mean annual rate of 1.6 percent since 1990. Despite decades of nominal growth, real growth has remained relatively flat for the last 25 years (Figure 1). Real growth is non-inflationary growth. 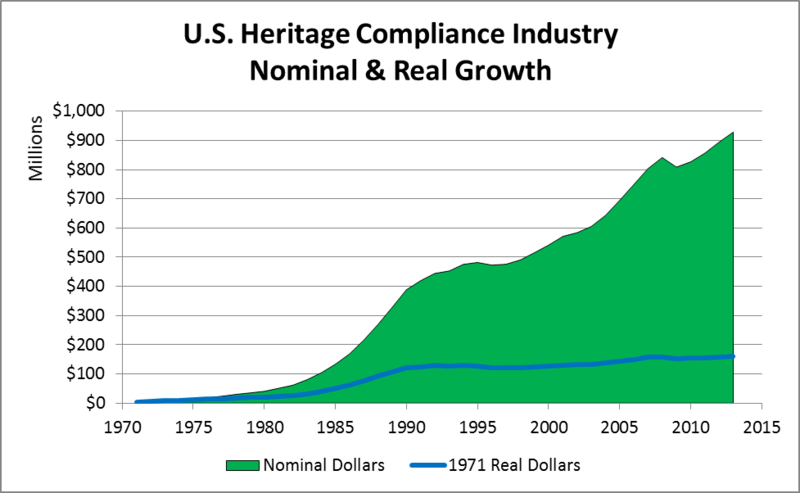 The U.S. heritage compliance industry is currently estimated to be just over $928 million in size and expected to reach $1 billion in 2015. Figure 1: While nominal growth has been increasing, real growth has been flat since 1990. During the 1970s and particularly during the 1980s, real industry growth hovered around 15 percent annually with the exception of 1979 and 1980 which had low, but still positive, growth (Figure 2). There have been only four years since 1971 with real negative growth: 1995, 1996, 1997, and 2009. An abrupt, but currently unknown, change took place in 1990 and marked the end of two decades of aggressive industry growth. Since this time, growth has remained in the low single digits. Figure 2. Since 1990, mean annual real growth has been only 1.6 percent. There are many ramifications of this new information, not least of which is the ability of the industry to attract investors as an entire generation of founding owners are divesting for retirement. New investors seeking a competitive return on their investment are likely to be reluctant to take equity stakes in firms in an industry without significant growth. Consolidation of heritage compliance firms in the United States continues as more and more owner/operators seek retirement and firms struggle to gain market share. Today, the largest heritage-only firms only hold approximately 1-1.5 percent of market share of the compliance sector, now at $928 million annually and forecast to grow to $1.25 billion by 2020. Yesterday, Heritage Business Journal (HBJ) received this press release from ASM Affiliates and Rechtman Consulting announcing a new merger. Company news can be submitted to HBJ from the “Submit Press Release” page. HILO, HAWAII – DECEMBER 3, 2013 – Rechtman Consulting has been acquired by ASM Affiliates (ASM). Going forward the company will operate as ASM Hawaii. Bob Rechtman will be leading ASM Hawaii as Managing Director for its Hawaii and Pacific operations. The transaction involved the assets of Rechtman Consulting including its existing contracts and proposals. All the current employees have joined ASM Hawaii. Henberger served as the exclusive advisor to ASM. Financial terms were not disclosed. “Rechtman Consulting’s reputation, its book of business and Bob Rechtman’s desire to join a larger entity, thereby allowing him to focus on his work and his clients, attracted us to this opportunity,” says ASM’s COO Bill Graham, who spearheaded the initiative. “To better serve our existing clients we had been looking for a while to expand our geographic footprint to Hawaii and the Pacific. The addition of Bob Rechtman and his team will allow us to accelerate our ability to meet the needs of our clients,” added John Cook, CEO of ASM. Engineering News-Record recently released its list of The Top 200 Environmental Firms. Published annually, this year’s list is based on 2011 revenue. Half of the top ten firms on the list provide in-house compliance services for heritage resources. On a similar list of design firms, seven of the top ten firms were in-house providers of heritage services. Australia’s “two-speed economy” features a dynamic mining and energy sector, contrasted to flagging retail and manufacturing business. Heritage consulting firms in Australia continue to flourish through providing heritage management services for mining and energy developments throughout the country. 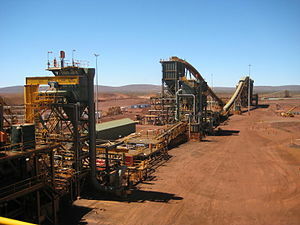 The plant at the Brockman 4 mine in the Pilbara region of Western Australia. According to current Australian Government budget projections, “following growth of 34% in resources investment in 2010‑11, resources companies expect to increase their capital expenditure by a further 74% in 2011‑12, supporting a strong outlook for commodity exports and activity in the related construction and services sectors.” The growth of resources sector investment in Australia for the 2011 calendar year is reported at $450 billion. In October of 2011, Charles Mount blogged about the correlation of construction output and archaeological licences in Ireland. The correlation was such that you could predict with some confidence, either licences or construction output, from the other. Clever, but what drives the Canadian CRM industry? Unfortunately, as pointed out recently in HBJ by Christopher Dore (17 February 2012), there is no North American Industry Classification System (NAICS) code for CRM archaeology and there are no country wide statistics on archaeological activity in Canada. Hence begins the quest for drivers for the Canadian CRM industry. Initial speculation was that price of oil was a significant driver in the archaeological economies of Alberta and Saskatchewan. Both provinces have growing and diverse economies, but the petroleum industry is an important component of the economy. There is no single price of oil, but the New York Mercantile Exchange (NYMEX) produced a nice online summary of the price of light, sweet crude. Saskatchewan has both light and heavy crude. For this analysis I looked at the maximum weekly price for the year, the minimum weekly price for the year, and the closing price during the last week of the year. 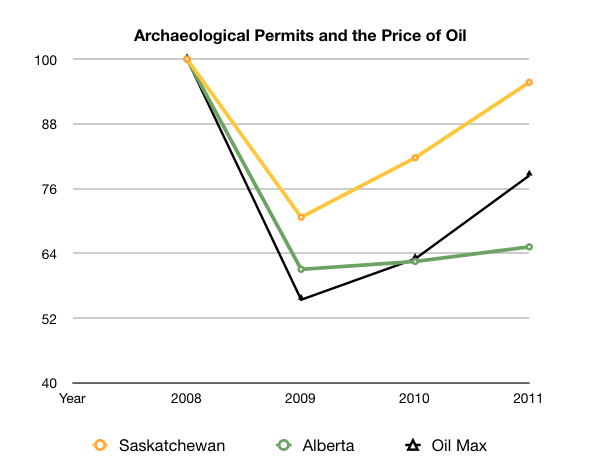 Next I looked at the number of archaeological permits issued by Alberta and Saskatchewan between 2008 and 2011. There are a few differences in the numbers and types of permits that both provinces issue, but these are not material to the analysis. Overall for this time period, there was a sharp decline in 2009 with a slow recovery in 2010 and 2011. The number of permits appears to be well correlated with the maximum price of oil (permits and oil prices are normalized to a maximum value of 100). Permits also correlated with the minimum and December close, however for the latter two, the price of oil leads the number of permits by a year. So the minimum price of oil sharply declined in 2008, the year with the highest price, but the decline in permits took place in 2009. Does this make sense? It does. There is a base price to drill and if the price of oil is too low, it is better to scale back production until prices rise. My prediction is that given the high December closing price, the number of archaeological permits will increase in 2012. What about other provinces? I am collecting data but I am curious what others think are the prime economic drivers of their regions. Brazil is the world’s seventh largest economy. It is also one of the fastest growing economies with a GDP growth rate of about 5 percent. Interesting news tidbits have been surfacing about contract archaeology in Brazil. Dr. Janet Levy (UNC Charlotte) recently told me that she learned at the last American Anthropological Association meeting that there is a demand for archaeology faculty in Brazil because archaeologists are selecting to work in the private sector instead of academia. I found this interesting and interviewed Dr. Eduardo Góes Neves, a Brazilian archaeologist, at the Society for American Archaeology’s conference in Panamá a few weeks ago. Indeed, he reported that private-sector archaeology is doing very well in Brazil driven by strong federal laws and the strong economy. There are mature companies across the country, some of which are quite large with multiple office locations. He also noted that there is currently a wave of acquisition of these firms taking place by companies based in Spain and Portugal. Given this interesting business news from Brazil, I’m pleased to note that Dr. Renato Kipnis is joining Heritage Business Journal to cover the heritage industry in Brazil. Dr. Kipnis is a Director of Scientia Consultoria Científica Ltda. in São Paulo and will be keeping us up-to-date on business issues.